God’s creation is all around us. 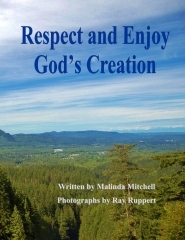 Ray Ruppert has provided the photographs and Malinda Mitchell provides great tips for children to learn how to respect His creation. Whether on vacation, visiting a farm, zoo, or just in their own back yard, children will be able to appreciate and learn more about the way we have been blessed with God’s creation. Each page is accompanied by photographs which will inspire children and adults alike. You will want to get this book and read it to your younger children or have your older ones read it to you. You can discuss how God has provided for us through His creation and how we should take good care of what He has provided. Malinda Mitchell resides in Mississippi with her husband, Alton. She has four grown children, a seventeen-year-old son, and eight grandchildren. Malinda has been writing fiction for all ages for more than forty years. Malinda’s favorite interests are spending time with family and friends, writing, and still-life oil painting. Malinda also had articles published in the 2008 summer and 2009 spring issues of Once Upon A Time Magazine before they closed their doors. She also writes for a card company. Ray Ruppert is an amateur photographer, author , and editor for Tex Ware Publishing. He lives in Washington State with his wife, Terri, where many of the pictures in this book were taken. The cover photo is of the Skykomish valley as seen from Wallace Falls.